Stories Of Teachers-Akshaya Patra Visit Government High School, Policy Colony. There is an excited bustle every Saturday at the Government High School, Policy Colony. The children are ready to watch 'I am Kalam', an inspirational Bollywood feature film highlighting the significance of education. G Ranganath, the Head Master of the school says, "Teaching methodologies should evolve with time. Children of today's generation grasp better when the message is conveyed through the audio-visual medium. It also makes the learning experience enjoyable." The principal states that this simple initiative has helped in improving attendance at the school. In the initial days, there were children who would never miss school on Saturdays but on other days they would not attend school. That's when it was announced that the children need to have good attendance record to attend the screenings. 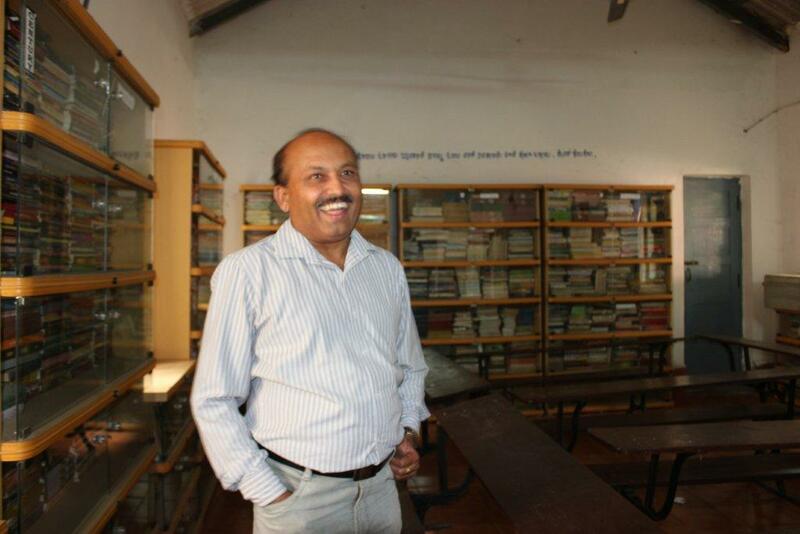 When Ranganath joined the school as Head Master, the highest score in the SSLC public examination was 73 per cent. In the 2012-2013 SSLC examinations, a student from the school scored 96 per cent. Incidentally, the same student has even authored a book in Kannada while pursuing his studies at the school. The large playground, numerous trees and breeze make the school an ideal place to study and play. Ranganath says he always held the environment close to his heart. He says, "Years ago I worked in a school which was adjacent to an open ground where people would often dump garbage. When I started planting trees, people questioned why I took the effort to do so. A few years later, the trees guarded the school from the stench." Here in this school too, Ranganath has planted and nurtured at least ten trees. During summer vacation when he comes to school, he is seen sitting under the shade of the Avenue tree, locally known as "Honge mara". Another highlight of the school is its library. In 2002, there were just 280 books in the library. The Head Master then set a target to collect at least 1000 books a year. Today there are 10,000 books spanning languages, academics, general knowledge and others. The children are allowed to borrow books and the library register tells that the children have developed a love for reading. Speaking about his childhood, Ranganath says, "Hunger and poverty was never new to me. I was driven by the will to succeed and secured the fourth rank in the state in the TCH examinations. I taught at the school in the morning and attended the evening college to pursue my Bachelor's and Master's degree." At present he is working on his doctoral thesis on adolescence. Appreciating the mid-day meal programme, he says, "The government, by partnering with organisations like Akshaya Patra, have ensured that children receive tasty and nutritive meal. The programme has been successful in reducing child labour and improving school enrollment and attendance."